Well, it’s June 22 and the weather in these parts has gotten pretty summery – though it’s a little bit cool today. But it’s Canada so there’s still a lot of hockey going on. The Leafs made a big trade for a goalie this week, expansion to Las Vegas is expected to be announced, and the NHL Awards from there will be handed out tonight. Still, the biggest news (though as yet unconfirmed) is that Ron MacLean could be back as host of Hockey Night in Canada, replacing George Stroumboulopoulos. Ratings are off (sorry, rest of Canada) because the Leafs have been terrible. And it didn’t help that no Canadian team made the playoffs this year. Yet the biggest problem is that the game isn’t as much fun to watch as it used to be. And that’s not just cranky “the game was better when I was a kid” talk. Yes, players are bigger, stronger, and faster than ever … but I’m not the first one to suggest that maybe they’re moving too quickly now. So fast, in fact, that there’s not enough time to be creative with the puck. There’s not much room for it either. The result is that not enough goals are being scored. I’ve written about bigger nets, and 4-on-4 hockey in the past, but really, if I could do anything I wanted to fix things it would be to reduce roster sizes. The Players Association would never let it happen, but if teams could only dress 10 forwards and 5 or 6 defensemen (like they used to), the game would slow down a little bit, which would open up more space and allow for more time so we’d see more goals scored. But since that’s impossible, all we’ll get is yet another minor reduction in the size of goalie equipment. It’s better than nothing, but this is an issue that goes back a lot further than you might think. Take a look at this cartoon from the Pittsburgh Press on March 22, 1908. I posted the segment at the bottom of this drawing, showing Art Ross and his wiggly moves, on Facebook recently. Today, however, I call your attention to the central feature – Montreal Wanderers goalie and future Hockey Hall of Famer Riley Hern. Despite the fact that he wears skinny cricket pads, regular playing gloves, no mask (but a jaunty hat! ), and is not allowed to fall to the ice to make a save (note the illustration in the top left), clearly what struck Artist Rigby about Hern was the bulky padding he was wearing on his upper body. He looks like a modern lacrosse goalie … or the Michelin Man, as hockey goalies these days have sometimes been called. As it so happens, it’s the size of goalie pants and upper-body protection the NHL plans on slimming down next season. And check out the “giant” goalie stick Riley Hern lent his name to in this Spalding ad from 1909. 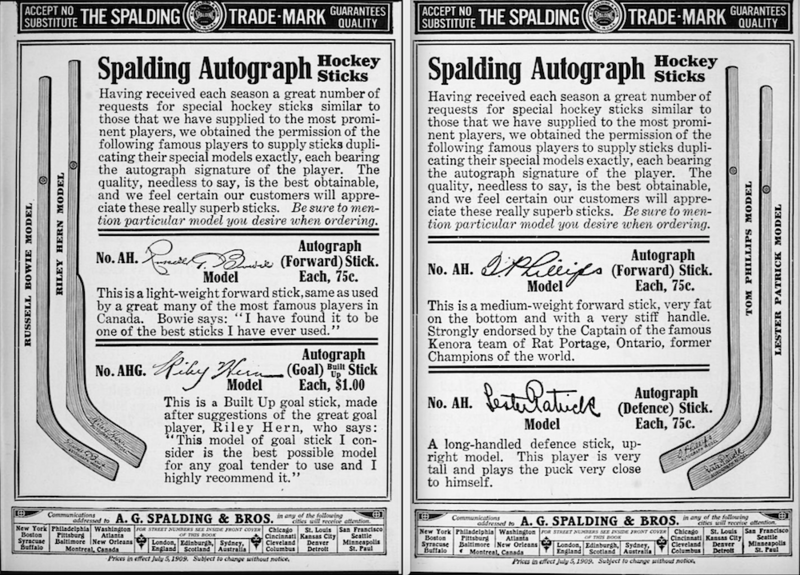 No one’s going paddle-down with that … although, in truth, my real point in displaying this ad is just that I think it’s amazing that future Hockey Hall of Famers were marketing their own brand of sticks as early as 1909! That was a fun piece, Eric. I agree with many of your points, lending to my opinion that the game has become boring for me. Too tight checking, no flow up and down the ice. I don’t think I’m alone there. 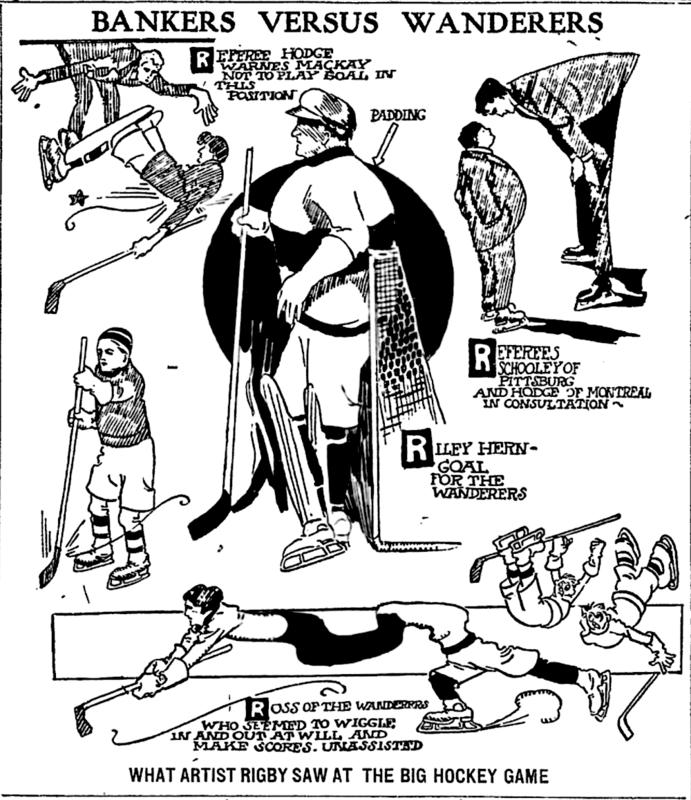 Good story Eric, and I love the old cartooning and the hockey stick ad. Does HHOF have any of these sticks? The Hockey Hall of Fame certainly does have a lot of old sticks … but I don’t think I’ve ever seen a goalie stick this old there and I can’t recall ever seeing any of these “Autograph” sticks. Another nicely crafted piece with great vintage tie-ins. The game is not as enjoyable for me but I think it is partly my age complemented by expansion, playing hockey almost year round, and saturation broadcasting. One wonders if Rogers puny numbers are not in part a function of burn-out as a result of saturation. Fun piece to read, Eric! I marvel at all the research you do. I’ve wondered about this for a long time. My eyeballs tell me that the players seem much bigger and certainly faster than when I first followed the game back in 1961. Frank Mahovlich @ 6’1″ and Moose Vasko @ 6’2″ were considered giants. How about this on a trial basis in scrimmages to see how it looks and feels. Once a team enters the offensive zone (on side of course), the linesman moves back to the center ice red line, and the offensive team now owns half the ice. This would give the offensive team more room to make plays and may tire out the defensive team trying to get the puck back. A less than 5 on 5 manpower situation might open up the attack even more. Sounds rather radical but it might be worthy of a least a look. Art Ross made a similar proposal in 1932! Ross had another plan in mind to speed up the game and cut down on offsides at the blue line. He wanted a red line painted across the centre of the ice, but not for the reason it would later be added to the rink in 1943–44. Ross wanted the ice split into two zones instead of three, with offsides only called at center and players free to attack at will once the puck had crossed the red line. Few others seemed interested, but the Bruins gave the new rule a tryout in their season finale on March 22, 1932. The opponent was once again the New York Americans. The result was far fewer whistles for offside and a lot more goals as the Americans won 8–6, but with two last-place teams merely playing out the string, no one was really sure how much effect the rule change had on what the Boston Globe called the poorest game of the season. Some interesting takes. I was shocked when Strombo got the gig. I never thought he’d last the season. I agree with you and your assessment, with no prejudice, I liked him well enough in other gigs and his previous ‘career’ but he was the wrong person. I love Ron and he IS ‘Hockey Night In Canada’! I don’t think there is anything wrong with the game itself, although I believe that shrinking the size of goalie equipment would help along with a slight increase in overall net size, but I agree with the comment of Aubrey Ferguson that ‘saturation’ is the problem. I believe that the NHL, Rogers and the WHOLE ‘HNIC’ franchise made a huge miscalculation by ignoring the principles of supply and demand. They created a glut and everyone, from Wall Street to OPEC to local housing markets, know what the immediate outcome of that is. To clarify my point, the blue line stays and the offensive team would have to be on side at the blue line before the linesman moves back to center ice thus expanding the offensive zone to the red line. So Ron McLean might come back? That would be lovely. He is a hockey commentator; just has a way about him. George Strombo is very cool but certainly he is not a ‘hockey guy’. I figured he was brought in to draw in the ‘younger hipster’ crowd to watch Hockey. I loved his show but could not make the leap to him talking hockey. Great post & I love the cartoon!